France vs Croatia: who wins in the travel stakes? I must start off by congratulating France for winning the 2018 FIFA World Cup. The stakes were high as the world watched two geographically close, yet vastly different countries, go into battle to not only bring home the trophy but also crown their country as champions. Okay, okay, that may sound a little too Hunger Games, but what I’m concerned about, is what’s behind the soccer teams. Which country truly wins when it comes to ticking off the ultimate travel itinerary bucket list? A nail-biter to say the least, join us as we delve into both France and Croatia, uncovering which will be crowned the ideal destination for travellers, not just soccer fans. France, a country rich in history, forward-thinking in fashion, arts and culture, not only offers the city of love but also an amazing coastline where the rich, famous and fabulous come to play. Croatia, alluring, diverse and beautiful. Untouched in some places, buzzing in others. Tickles any itch, whether that be immersing yourself in nature or indulging in food, wine, and beach bars. First things first. Capital cities. From the Louvre to the Notre Dame cathedral you’ll need a pencil sharpener as you tick off your bucket list one attraction at a time, and for that reason Paris wins this round. Like any tourist, you’re expected to get a bottle of wine, cheese and biscuits and sit under the Eiffel tower, relishing the fact that you’re actually here – and if you don’t see the Mona Lisa did you even go to Paris? Get these tourist attractions out of the way ASAP so you can finally knuckle down and see Paris for what it truly is. Between the terrace cafes and restaurants scattered throughout the cities, there are alternative neighbourhoods housing speakeasy bars like the Little Red Door in the 3rd arrondissement. Our favourite has to be the Centquatre-Paris, a cultural melting pot of performance, art, music, and theatre. The Centquatre-Paris invites you to what was once described as a cultural wasteland in the 19th arrondissement – the site of a former municipal undertaker – to what is now a buzzing space for artistic creation. Congratulations, Croatia you’re on the scoreboard and you’ve got Plitvice Lakes to thank for that. Upon exiting my tour bus for a split second I thought I’d died and gone to heaven. UNESCO heritage site listed and rightly so, this breathtaking national park, with its unique turquoise waters, should be on everybody’s bucket list. With water clarity so still and clear you can see fish frolicking beneath you as they bask in pure bliss knowing that their protected home allows no fishing. The hardest part of your day will be deciding which of the 90 waterfalls to adventure to see. Paris made me fat and I’m sending it an invoice to buy me new pants. The pastries, bread, cheese and wine – and did I mention cheese? Yes, I like French food and yes, I very much embraced YOLO throughout my travels. After all, what would a visit to France be without indulging in the local cuisine? Croatian food was OK but did I mention France has wine, cheese and cheese? You’d think France would win this one hands down. With the Louvre, Versailles and the Centre Pompidou – was it ever a competition? Shockingly, we’re going to go against the grain and award the win to Croatia. After all, art is subjective. The Museum of Broken Relationships located in the country’s capital, Zagreb, explores mementos left over after a relationship comes to an end. Some hilarious, some crazy and some heartbreaking, this global sensation was given the ‘most innovative museum’ Kenneth Hudson Award by the European Museum Forum in 2011. Both have an year-round holiday vibe, offering sun, sand, scenery and recreation. The French Riviera offers over-the-top luxury and days filled with rosé, sunburn, leisurely seaside lunches – and world-class partying. 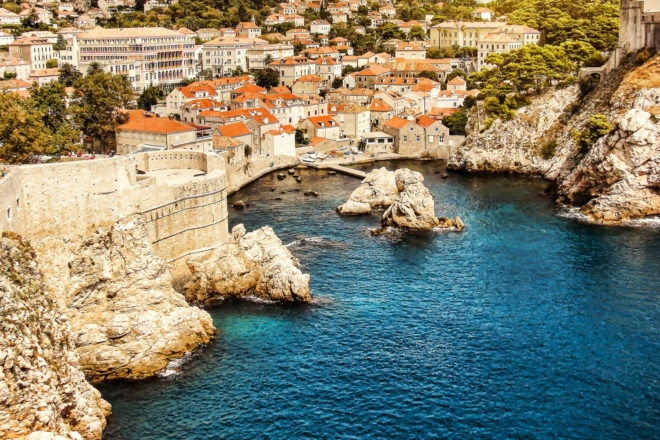 The Dalmatian Coast invites you to island hop from one old historic town to the next, getting lost in the majestic alleyways only to pop out at what will probably be the most beautiful beach you could ever imagine. Both offer a similar yet different holiday experience. The glitz and glamour of the French Riviera or the astonishing beauty of the Croatian islands, it’s a tough one, but we think we’ve found a winner – sorry France. Two amazing coastlines and two incredible countries. Although France may have won the World Cup, we’re going to go ahead a give this win to Croatia. Its beauty, affordability and versatility make this the ideal holiday destination for your next getaway. Whether you’re a honeymooner, a nature buff or a student on a gap year, Croatia has something for everyone.